I have started a new series for Thursdays on A Compass Rose called ‘Travel Throwback’. Every week I will dive through my travel photo archives and share with you a photograph. One of my most favourite places that I have been to was Cambodia. I have wanted to go there for so many years and was so excited when my parents surprised me with a trip there. My parents and my younger sister had been spending the summer backpacking throughout South East Asia while I was taking care of my one year old during my husband’s time consuming training with the US Air Force. They decided to give me a little vacation and fly me out to Cambodia to meet them before my father and sister returned home to the US. My mum and I then spent the next several days in Cambodia for the Asian Mission Conference that year and then went on to Thailand. This was one of my first photographs that I took outside our hotel in Cambodia at the beginning of our travels. I was so excited to be in Cambodia and honestly I cannot wait to return again. The idol looks like an Indian Goddess. They have some amazing sculptures there and the people are so beautiful and nice. Brilliant pic. Cambodia looks like an amazing place. Thank you Louisa! It is and I hope you can go one day. So beautiful. Looking forward to reading more about your past travels! So cool I’ve been doing this a few times on thursday now in style of the Throwback Thursday’s you see on twitter and instagram. I like the name Travel Throwback more though! We are heading to Cambodia in April for the first time and are very excited. We’ll be in Siem Reap and Phnom Penh if you have any tips to share. Definitely try the khmer food and talk to the locals, everyone we met was so friendly. 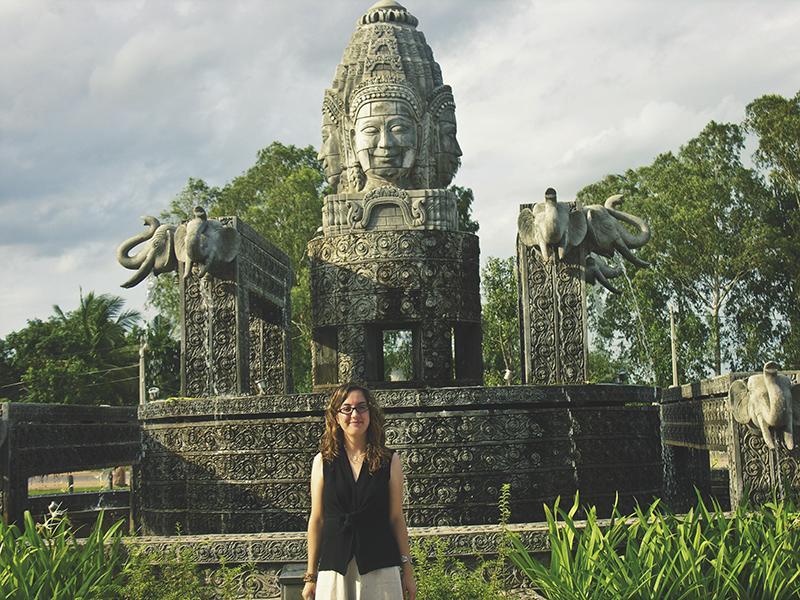 My whole family went to Cambodia last year–but not me because I was stuck over here in the US! They say it was one of their favorite trips of all time, I hope to go someday. I love reliving old travels – it’s the best way to keep them alive in our memories! I just went to Cambodia and Thailand last week, and I LOVED Cambodia. So beautiful and the people were so friendly and inquisitive. I’ll definitely be sharing Cambodia posts/pictures for your TT linkup over the next few weeks.